Sub-tropical – the coastal and inland fringe from Cairns along the Queensland coast and hinterland to the northern areas of New South Wales and the coastal fringe north of Perth to Geraldton in Western Australia. Approaching cyclonic storm east of the Serpentine Lakes, Great Victoria Desert, on the border of South Australia and Western Australia. Image courtesy of CSIRO Land and Water. The tropical regions of Australia, in the north of the country, including the equatorial and sub-tropical zones have high temperatures and high humidity and distinct wet and dry seasons. In the Australian tropics the wet season, called the monsoon season, lasts about six months, between November and March. It is hotter than the dry season, with temperatures between 30 and 50 degrees Celsius. This is because of the high humidity during the wet, which is caused by large amounts of water in the air. During the wet there is a lot of rain, which frequently causes flooding. The 'build up' is the humid time of year between the wet and dry seasons. It usually lasts for three or four months. Things become quite tense during the 'build up' as people sit and swelter in the humidity while waiting and hoping for the first rains to come. The humidity continues day and night with no respite, so when the rains finally do come everyone enjoys their cooling relief. In the southern capital cities: Sydney, Canberra, Melbourne, Hobart, Adelaide and Perth, defined by the temperate zone, the average temperatures are: Summer minimum 16 and Summer maximum 26 and Winter minimum 6 and Winter maximum 14, all in degrees Celsius. In the sub-tropic and tropical cities the average minimum temperatures are: Brisbane 16 and Darwin 23 with the average maximums: Brisbane 25 and Darwin 32. In the inland city of Alice Springs, surrounded by desert and grassland, the average minimum is 20 and the average maximum is 32. Since the 1950s, Australian temperatures have, on average, risen by about 1°C with an increase in the frequency of heat waves and a decrease in the numbers of frosts and cold days, except in the regions immediately to the west and north-west of Sydney. Since 1900, the sea temperatures are showing to be two degrees warmer. Indigenous people's knowledge about the weather, and their descriptions of the seasons and climatic conditions is recognised today in work with scientists and the Australian Bureau of Meteorology (BOM). These descriptions can be useful as they are more detailed and therefore more informative about what the weather is like to experience. The tropics are affected by the extremes of cyclones in the wet season and the inland deserts can remain totally dry for years whilst rains can produce floods. The wettest months in the southern capitals are from May to July. Along the Great Dividing Range, the mountain range that passes through New South Wales and Victoria, there are regular winter snowfalls. The snow season in the Alps in south-eastern Australia is June to September. Overall, rainfall patterns have also changed – the northwest has seen an increase in rainfall over the last 50 years while much of eastern Australia and the far southwest have experienced a decline. Cyclones are a tropical weather phenomenon. They are usually encountered in Australia between November and April, and they mostly take place in the north of the country. 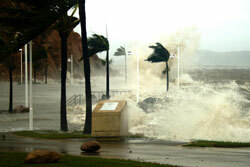 The Western Australian and Northern Territory coasts, as well as the Queensland coast, are the usual places that cyclones occur. About six cyclones happen in Australia every year. By far the most famous cyclone in Australia is Cyclone Tracy, which hit Darwin in the Northern Territory on Christmas Eve 1974. Forty-nine people died as a result, and over 600 people were injured. Darwin had to be evacuated because over eighty per cent of the city was destroyed. But Tracy is not the worst cyclone to ever visit Australia. In 1899, Cyclone Mahina killed over 400 people when it destroyed an entire pearl-fishing fleet at Bathurst Bay in Queensland. Trees shaped by the weather along a track near Margaret River crossing, c1920. Image courtesy of National Library of Australia: an24431083. The driest regions of Australia are found mostly in central Australia, in the arid and semi-arid desert regions with high daytime temperatures and low amounts of rain. The dry desert regions of Australia are characterised by intense heat during the day and intense cold at night. Temperatures range from around 40 degrees celsius in the summer to between 16 and 24 degrees celsius in the winter. At night the temperature can vary from 19 degrees Celsius to zero degrees Celsius. Desert conditions are different from drought. A drought is an unusually long period of time when there is not enough water for people to use in the way they normally would. There have been many serious droughts in Australia in the last 200 years. The 1895–1903 drought lasted eight years and caused the death of half of Australia's sheep and forty per cent of its cattle. The 1963–68 drought caused a forty per cent reduction in wheat crops across Australia. In central Australia that same drought actually lasted eight years, from 1958 to 1967. The great Australian droughts of the twentieth century have mostly been closely linked with the major swings in the Southern Oscillation Index (SOI) with drought in eastern Australia coinciding with the El Niño (warm central and eastern Pacific Ocean) phase of the El Niño-La Niña cycle. Alan Reid, Banksias and Bilbies - Seasons of Australia, 1995. Bureau of Meteorology, A hundred years of science and service, 2001. Your feedback helps us improve australia.gov.au.